Former Ukrainian Interior Minister and currently leader of the Third Ukrainian Republic organization Yuriy Lutsenko, who is in an intensive care unit after being injured in the January 10 clash between protesters and police in Kyiv, has been questioned by an investigator, his wife Iryna Lutsenko has said. "My husband is currently in the intensive therapy unit... an investigator came at 1100 to take testimony concerning the events of January 11," Iryna Lutsenko said at a press conference in Kyiv on Monday. According to her, the interrogation lasted for about two hours, after which she was also questioned. 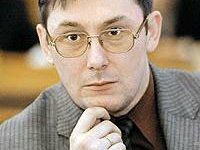 She added that Lutsenko has received an official status of victim of a crime. The ex-minister's wife also said that doctors expected her husband to stay in intensive care for at least another week.